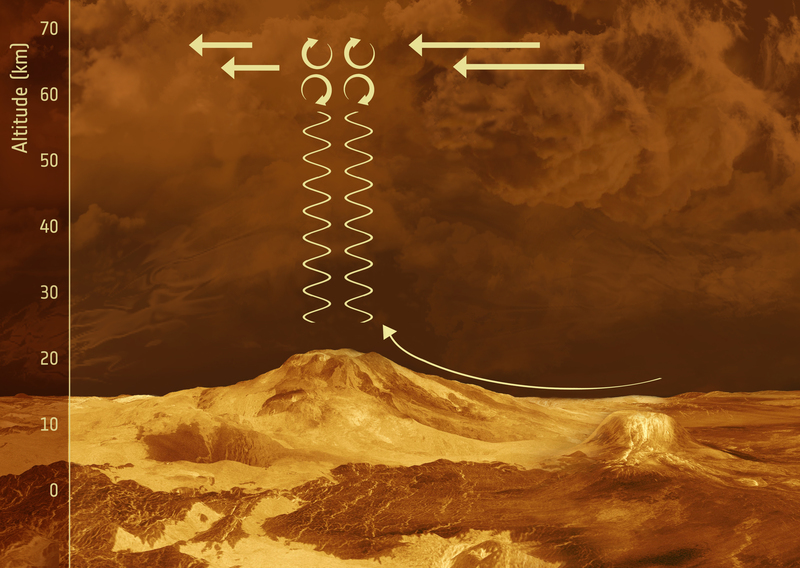 Schematic illustration of the proposed behaviour of gravity waves in the vicinity of mountainous terrain on Venus. Winds pushing their way slowly across the mountainous slopes on the surface generate gravity waves - an atmospheric phenomenon also often seen in mountainous parts of Earth's surface. These waves form when air ripples over bumpy surfaces. The waves then propagate vertically upwards, growing larger and larger in amplitude until they break just below the cloud-top, like sea waves on a shoreline. As the waves break, they push back against the fast-moving high-altitude winds and slow them down. The background is an artist's impression of the surface of Venus beneath the cloud tops.